Chad is learning the hard way that sometimes it just doesn’t pay to be nice. Never, in a million years, did he think his little deposit into a paper cup would get dropped off his door step. But, his three-month old daughter, Annalee is living breathing proof that Fate has a twisted sense of humor. The Good Life starts out with poor Chard knee-deep in a panic attack. When he agreed to donate sperm to his friend, Elizabeth, he just assumed she would always be around to take care of her kid. Hell, they weren’t even that close. If his name hadn’t been on Annalee’s birth certificate, it could have been months before Chad even found out Elizabeth was dead. Fortunately, just like he has always done, Sonny comes up with the perfect solution for Chad’s new little family. They can use his spare rooms and he can help out as much as he can. Who knew that having his crush under foot could be pure hell? I am such a sucker for friends to lover romance and insta dad stories really do it for me. When they are combined, you really have to screw up for me not to enjoy it. 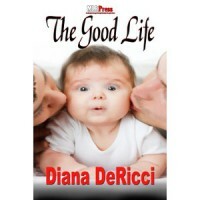 Fortunately for me, Diana DeRicci is one of the biggest romantics people who I know and The Good Life was a joy to read. She spun a tale that had me smiling and awwwing from beginning to end. Chad goes through so much just trying to adjust to parenthood. Then to have his straight best friend profess love was just too much. Was the storyline kinda predictable? Maybe a little. Was the dialogue sappy? Sometimes. Did I absolutely love it? Hell, yeah. This is the kind of sweet romance that is perfect for Father’s Day. I knew there was a HEA coming, but DeRicci made me work for it. I mean, Sonny loves Chad, and Chad loves Sonny, but does Chad really love Sonny, or is he just a convenience. There was just enough twist to make a potentially tired plot sparkle. I recommend this one for readers who like HEAs, but want to believe neither party is just settling for the nearest warm body.